Caboose 1732 at Kansas City, Missouri on September 20, 1980 (James Primm II). E7A 2002 at Springfield, Missouri (date unknown). This is the passenger station locomotive service track area just northwest of the Springfield Depot complex. 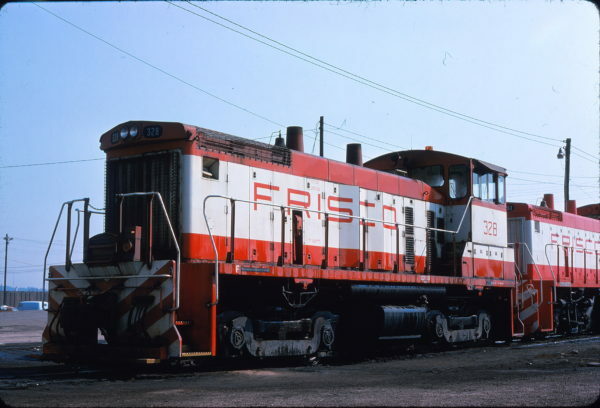 The passenger locomotives in this early pairing are E7A 2001 and 2002. Due to the open coupler shroud on the west end, it is speculated that the locomotive consist is for an east (St. Louis) or south (Memphis/Birmingham) bound train. Steam locomotives are still in service and at least one can be seen in the distance on the north depot tracks. To the left of the diesels, above the steam engine, the bridge overpass running north (left) to south (right) in the distance is North Grant Avenue. The depot is in the distance hidden behind the locomotives. To the immediate south of this location and extending to the west is the South Yard. 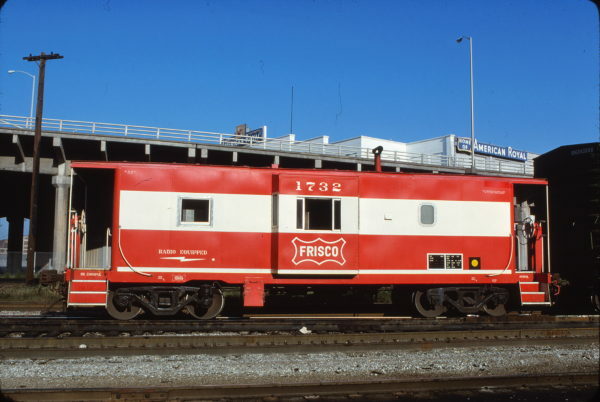 This yard was the original main yard in Springfield of the Kansas City, Fort Scott and Memphis Railway Company (KCFS&M). After its merger with the Frisco in 1901, it became a satellite yard to service the depot and local industries. 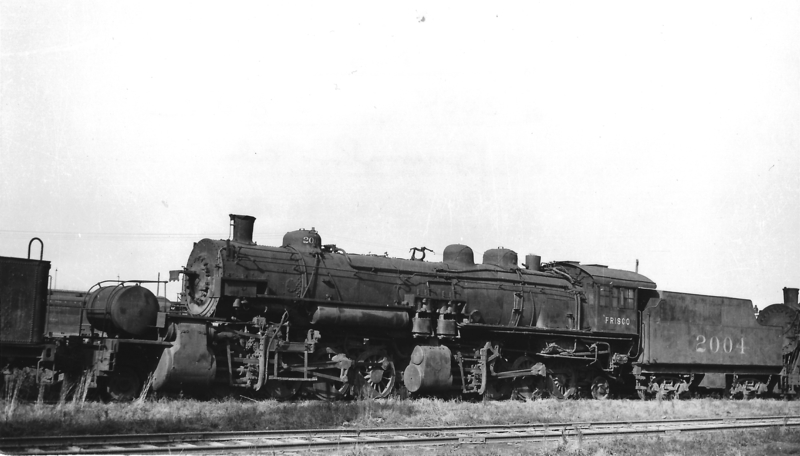 The date of the photograph is shortly after the delivery of the first E7A units in March 1947. 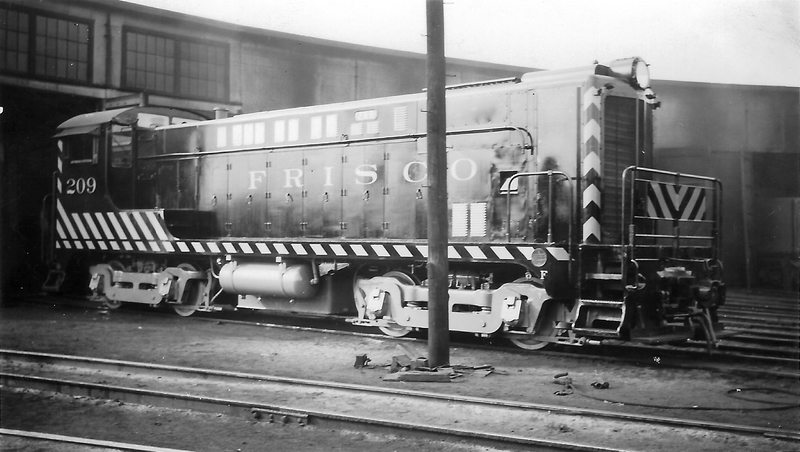 The Frisco ended the use of steam in February 1952. The use of steam ended earlier than that date in the Springfield area. The photograph was taken from very near West Wall Street and North Missouri Avenue and the view is looking southeast. 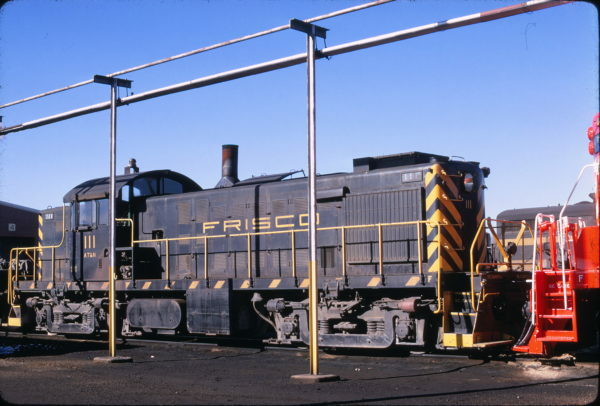 RS-1 111 on the Springfield, Missouri Dead Line in December 1968 (Mac Owen). 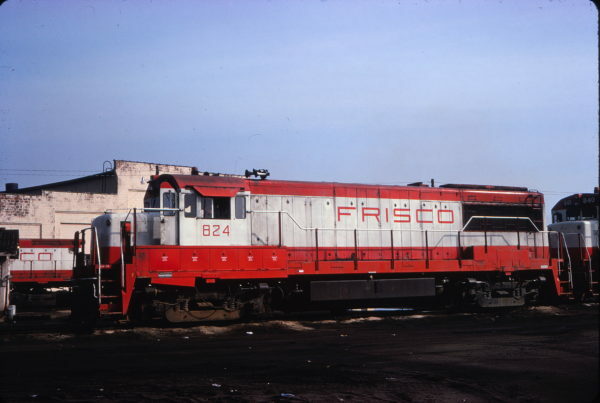 U25B 824 at Birmingham, Alabama (date unknown). This photo was taken at the Frisco’s East Thomas Yard. The locomotives are sitting in the Mechanical Department service tracks area south of the roundhouse. 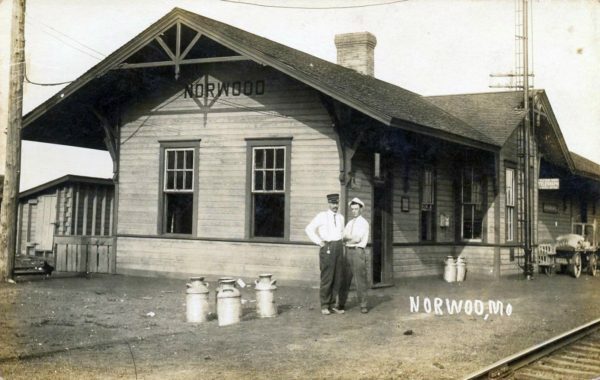 After converting from steam to diesel power, the number of roundhouse stalls was reduced and the shop renovated to service the new locomotives. The locomotive turntable sits behind the engines to the west (left in this view) in front of the shop. The view is looking north/northeast. 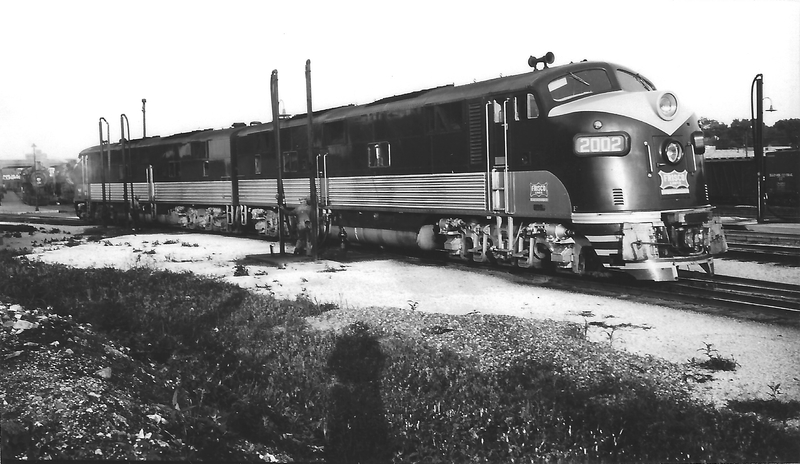 VO-1000 209 at Springfield, Missouri on September 9, 1947 (Arthur B. Johnson). 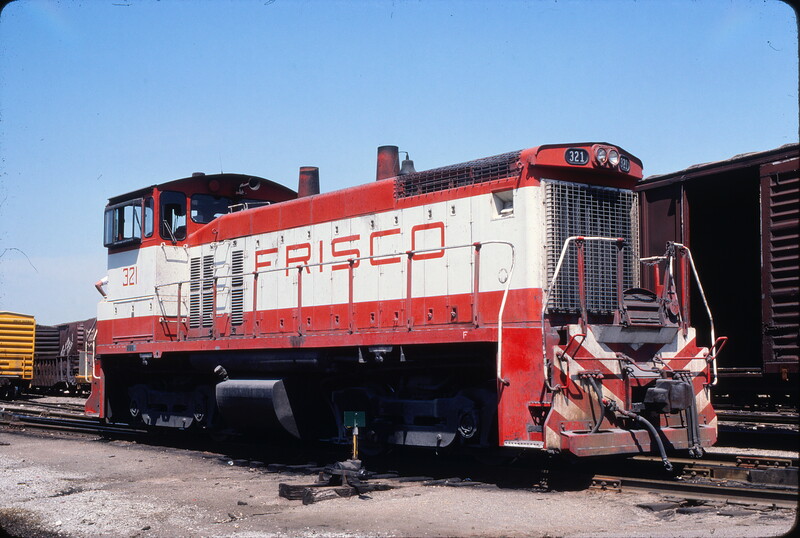 SW1500 321 at St. Louis, Missouri on July 1, 1980 (J. Harlan Wilson). 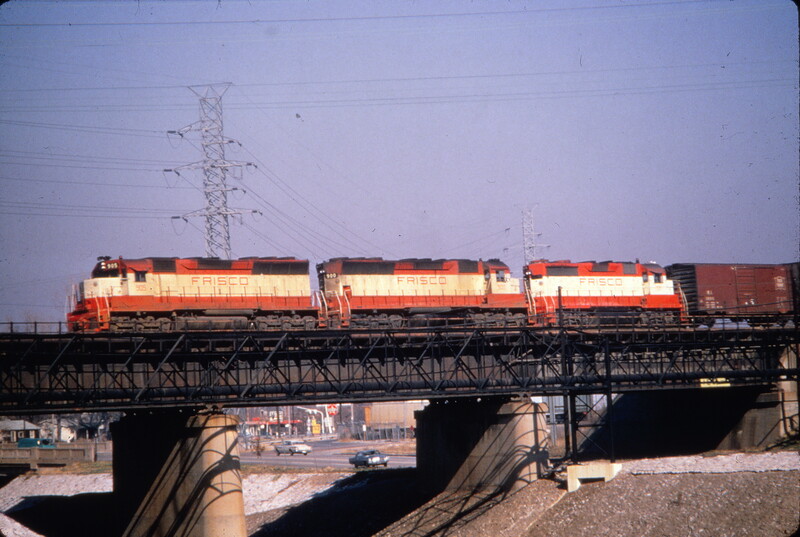 SD45s 905 and 900, and GP35 721 at St. Louis, Missouri (date unknown) (Al Chione). The train is westbound on the Rolla Subdivision just departing the west end of Lindenwood Yard. Just across the bridge is Southeastern Junction. At this point the St. Louis Subdivision connects and turns south toward Memphis. On the left, under the head end of the train, is the River Des Peres. This is just south of the confluence with Deer Creek. To the right, under the GP35, is Wellington Avenue/Wabash Avenue. The photo was taken from Interstate 44 and the view is looking northeast. 2-8-8-2 2004 at Birmingham, Alabama on December 30, 1937 (Arthur B. Johnson).